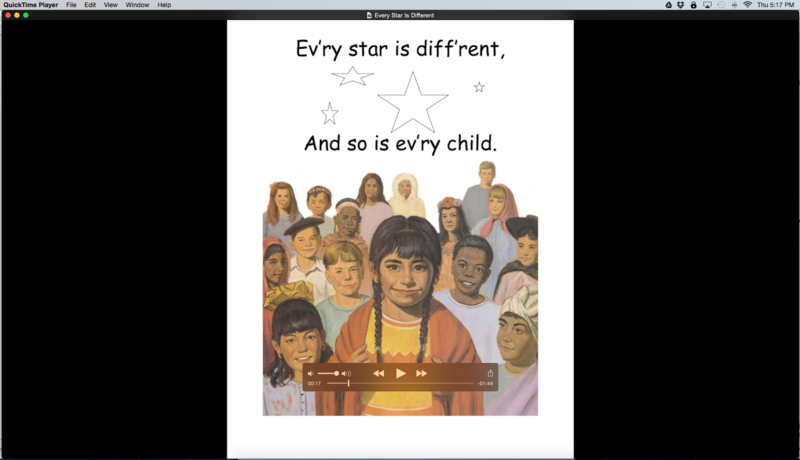 Each year I present sing-along videos (aka Primary Program Showcase) in January to introduce all the songs we will be learning that upcoming year for the program. I thought I would share how I create them in case some of your songs are different than mine and you would like to create your own. I work on a Mac computer so my instructions may be different if you are on a PC. If you are using a PC, I'm sorry, I may not be of much help. Also, before you begin, you will want to have the music you are going to use added to your iTunes music library (this is necessary in creating your videos). Download (or create) a flip chart for your chosen song. I've mostly downloaded from jollyjenn.com. They download into a PDF format. Save onto your computer. Create a new document and title it the name of your song. Choose "no theme" which will give you a basic layout. I didn't want anything fancy with these. Drag and drop your JPEG files or import into iMovie (if you are on a PC, I've heard of Moviemaker as an option). Crop (near the upper right) the documents to "fit" so they fit full screen when played. Go to the "Audio" tab and choose your music from your iTunes file. Drag the file from the list to the box below. Align the beginning of the song with the first file. Transition the pages so they correspond with the JPEG files. You want the words on the page to match what is being sung. I left the space in between the transitions as default as I thought it was fine. End the music with your last file. Review your file and make any necessary corrections then "share" the file by going to the upward arrow in the upper righthand corner. You can select the option that fits you needs. I exported to iTunes since I was loading them on my iPod. If you will be showing them from your computer, selecting "file" will be the best option for you. Name the file and save. Let me know if you have questions!! If you've created these a different way, please share as I'm sure there is more than one way to create them. You can find all of my sing-along video posts (aka Primary Program Showcases) HERE. You're the best!!! Thanks for sharing all that you do!!! Hi Camille! I'm wondering if there is a problem with the link to see your sing-along video posts? I am also doing "Every Star" and can't find a good video for that on YouTube. Anyway you could post that? THANK YOU so much for all the sharing you do!!! May we have access to the "flip charts" used in the imovies you made for 2017? Or if you have already set a link for them would you let me know! I am so grateful for your page/blog - Thanks you for sharing your talents. Do you know if there are music mappings for songs? I find it a great way to teach a knew song.